After 39 years underwater, she was recovered in 1983 through the efforts of local Greenville, South Carolina businessman Matt Self and a US Navy reserve diving team. The Navy diving team used this recovery as an exercise for their reserve requirements. Various flotation equipment and recovery devices were required to raise the aircraft from the over 100 feet of water it had called home for nearly 30 years. The aircraft was moved to the shoreline where a mobile crane lifted her out of the water. After an initial survey of the aircraft for corrosion and structural integrity she was moved to the airport. By 1992, she had gone through a series of owners and a cosmetic restoration. She was displayed at the 50th anniversary reunion of the Doolittle Raiders held in Columbia. Again, 10 years later in 2002, she was displayed at the 60th Doolittle Raiders reunion repainted to appear identical to Lt. Col. Doolittle's B-25. At this point, there is some controversy. 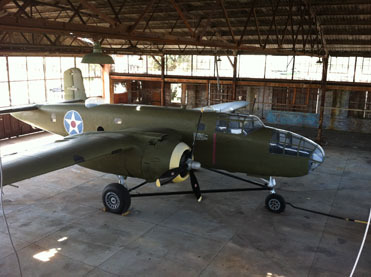 The South Carolina Historic Aviation Foundation refers to this plane as "GF2". You may still hear her referred to as "Skunkie". Her condition is a bit questionable. This is to be expected in an aircraft that spent 39 years under water. Her spars have significant corrosion, and even her skin is questionable in spots. Unfortunately, she will likely never fly again. Current information has her being restored to static by the South Carolina Historic Aviation Foundation. Her eventual display location is currently unknown. Notable info:One of just a few remaining B-25C-NA airframes remaining. This page represents the most current information we have on this aircraft. The information above was last updated 05/2018 with information provided by Bob Haney. Our goal is to have the most current and correct information possible. If you have any information about this aircraft not listed here or see anything posted in error, please contact the B-25 History Project so we may update our records.